Ratings are averaged based on 35 reviews. excellent accomodation .very clean .great staff.good for families. Resort was wonderful. Great value. Beach front with beautiful beach for swimming. Lovely clean pools, resort had many facilities. Restaurant on the beach was added bonus. Would definitely recommend to families. We had the family room with two rooms and two bathrooms - super spacious. Kids clubs were super. My three year old loved it. my older ones enjoyed teen club too. the shows in the evening were so much fun for adults and kids. highly recommend and hopefully we will get to go again soon. Wow wow wow !! I’ll be back there . The kids had a blast , what an awesome resort. Resort is isolated from shops and nightlife but had some restaurants nearby. Beach in front of resort was clean but further down the beach we saw a lot of rubbish including needles which was concerning. We found food variety limited especially for pre-teen and 3 year old. Teen room was great and Miniland was good except we had to supervise our own child so no downtime for parents with under 8 years. Pools and grounds were beautiful and well maintained. Rooms were ok but could be improved eg bathroom has no bath and could clearly tell it was only renovated. Due to moisture the room often smelt musty especially when the air conditioner was on and doors closed. Transfer to and from hotel and other tours through My Phuket were good. Driver on Free tour with package however couldn’t understand English so this made it hard. Grace who we met to organise tours was great though. Overall we had a nice holiday but we would stay elsewhere if we return to Thailand so we were closer to activities but if you want to relax and stay in the one place this is a nice place to do it. An awesome resort, at a stunningly beautiful location. We were greeted by friendly smiles & an amazing welcome pack - including, fruit, chips, softdrink, wine, beer etc. What hit us was the cleanliness of the resort. Always smelt so clean & people ALWAYS cleaning. For most of the stay it felt like we were the only ones there (we went a week before school holidays). Kids loved it even more when more kids arrived. We just had the pleasure of staying here during the low season. There would have been no more than 40 people in a resort that probably caters for hundreds. The Royal Pool access rooms are very clean and a must have, the staff are great. You can even stock your own large fridge with drinks for your private patio sun lounges. The deal from travelonline is better than any direct deal or trivago etc... A few good restaurants nearby - best Thai Sugar Cane across the road. Beach is cleaned at resort but full of debris elsewhere. We had the most amazing 2 weeks stay at the Sunwing Bangtao. It is such a good set up for families with its multiple pools, very good kids club and being right on the beach. The restaurant is great and there are lots of others within walking distance for when you want a change. Only tiny negative is that it's a bit far out from Patong/Phuket Town but there are plenty of shops, markets and attractions nearby if you aren't that fussed. We had a great stay and are already thinking about our next visit! Great hotel for families. Dining options are a bit limited both within the hotel and in the surrounding area. General area is pretty quiet and less developed than other parts of Phuket. What a great resort. Big comfortable rooms, great food with breakfast catering for every nationality, beautiful restaurant open to the beach. Clean lovely pools where the kids spent most of their time. The staff were ALL very friendly and helpful. A low pressure location, you have to seek out the markets. Good restaurants very close and moneychangers and minimarts closeby in multiple directions. Value for money in low season was outstanding. Really good value for money. A little further out from things than I would have liked, but great for kids. So happy we stayed here. Everything was amazing and so many things for kids to do. Always served with a smile. Cannot fault sunwing bangtao beach and already planning our return! We had a great time at the Sunwing Bang Tao. The 2 bedroom apartment was large and clean. Beds were very comfortable. The hotel pools were clean and inviting, and the hotel grounds were well maintained. I travelled solo looking for peace and relaxation and I found it at Sunwing Bangtoa resort. There were a few young families there but everyone was friendly and quiet. The resort has numerous pools which are clean and inviting. As it is right on the beach you can also swim in the ocean. My room on the third floor with balcony was spacious. All the staff I encountered were friendly and professional. The food was also very good, with a huge selection at breakfast. I would definitely return as I didn't need to leave the resort and returned home relaxed and happy. Great resort, great location right on the beach. Offers something for everyone. Fabulous buffet breakfast and facilities including kids club. As it was our first time there, the staff could have been a bit more forthcoming with information about the hotel and what is available nearby eg. taxis, restaurants, supermarket. It is helpful to do your own research on the surrrounds. At the time of year we went there were a lot of younger kids and toddlers. So pool was a bit crowded at times. Would definitely consider holidaying there again. This is a great resort but failed to give me my preferences that I emailed them. I asked for a room next to the pool and was put in a second story room, asked for a cot but there was no cot when I arrived. The staff were happy to move me to a room next to the pool, however I had to stay in the second story room for 4 days before the other was available. The staff are pretty nice but I think there is a bit of a communication barrier as they don't understand much English. The beach was great and Sunwing section was clean, the pools were clean and a lot of fun. Massages next to the beach were good and give great value for money (300 baht for 1 hour massage, around $12 aussie dollars) compared to the spa within Sunwing resort. Rooms were pretty tidy apart from a bit of mould in showers ect. Beds were super comfortable and huge! I wasn't woken by noise in the morning either which was great. Only noise that could be heard at night was if someone had fireworks on the beach which was fine as it wasn't that loud anyway. If you want to be next to the pool then ask to be in block 4 or 5 which are right next to one of the pools where you can swim up to the back door of your room. We stayed in the two bedroom room 4102 which I would recommend asking for but make sure they confirm it . Restaurant was very clean and everything seemed fresh however it was quite pricey but found that most of the food on phuket cost around that much. (Equivalent prices to australia.) The breakfast buffet was great with heaps of food and drinks to chose from. Great resort for families and can give 4 stars. 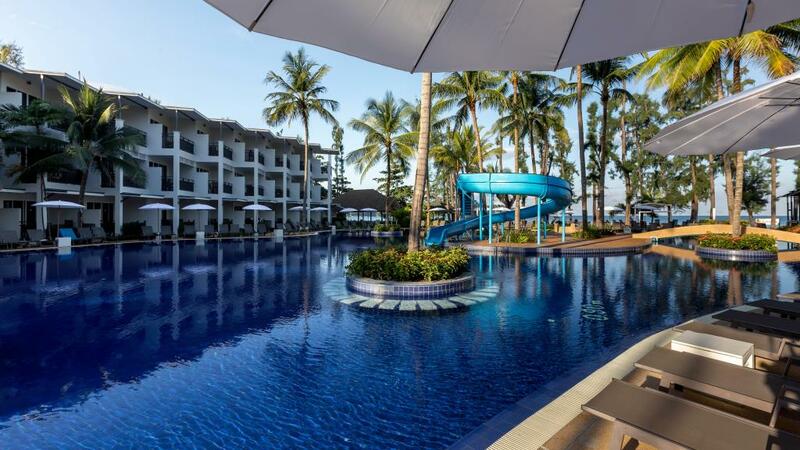 This resort has everything you need for a a good family holiday. Food is yum and staff is very friendly. It is very good value for money. Nice stay at this resort, especially recommended for famuly with kids, services generally good but some staffs can be not so friendly. The local was amazing, the resort opened straight onto the beach. Bang Tao, is a quiet town, that has a slower pace than Patong. The resort pools were beautiful and clean. There were many pools, kids pools, a quiet adult pool and a water slide, which the kids loved. The gym had the best equipment, and they also have yoga and pilates classes. The restaurant is right on the beach. The buffet breakfast is one of the best, I've ever had. The lunch and dinner menu included both western and Thai food. We enjoyed the Thai food and ate in the resort a few times. But you can also walk up or down the beach to the many restaurants. Kids under 12 ate free with an adult meal. We couldn't have had a better holiday. So relaxing, we didn't want to leave. We had private pool access and loved it. The restaurant was directly at the beach and we had some spectacular sunsets while dinner. Food is quite acceptable. The staff, except the reception, is not so professional but very friendly. Rooms are spaceful and clean. The low season is good for couples without family. Our stay was for 12 nights (end of October 2014) with 3 children aged 4,7 & 8. we found our rooms to be a great size (2 bed room) the three children fitted in the 2nd bed room with ease, the room was cleaned & freshened everyday! we walked about 10 steps to the nearest pool & maybe 100mtr to the dining area at the beach front. we liked the fact that Bangtao Beach was away from the hussle & bussle of the busy areas of Phuket, but for a short & cheap (25min) cab ride you are in Patong and right amongst it but then can go home to the peace of this beautiful family friendly resort where nothing was to much trouble. Can not wait to go back! We have just stayed at the sunwing for 12 days and had the most amazing time. We have 2 children(9 and 7) and went with friends who have 3 chidren (8,7 and 4) and you couldn't ask for anything more. Great rooms, amazing pools and all set on a beautiful beach aswell. The people are sooo friendly and couldn't help you enough. We had the buffet breakfast included and that was awesome, a great way to start everyday. also we had many lunches and dinners there which was beautiful food with more than enough to choose from and the kids ate free. Would definately recommend this place to other families travelling to Phuket. Great holiday. Fantastic pools and great food. An awesome resort that considers "families" to be the norm - with no extra charges for rollaway beds or breakfast for the kids. Good location, nice beach, great pools, good kids club, spacious room, comfy beds, nice restaurant, helpful and friendly staff. We have been twice and will go again. It is a lovely place to holiday with 3 children aged 6,4 and 2. This was the perfect place for us to stay as a young family. It had everything that we needed and the staff were always friendly, helpful and understanding of our noisy offspring. Fantastic place for a family holiday.